Arriving into Bratislava felt like a new part of our journey. We were really getting into Eastern Europe now. If you had asked me six months ago where Bratislava was, I probably would not have even been able to say what country it was in. 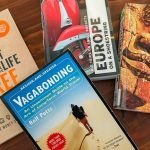 It is only a short train ride, about 70km from Vienna, but it felt like we had taken a huge leap as we stepped off the train. 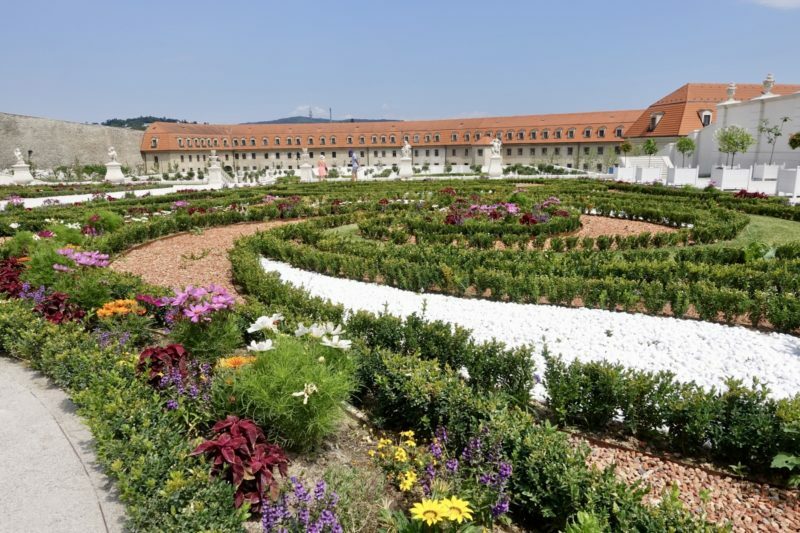 Austria is clean, neat and organised, Slovakia not so much. There were crowds milling all around the train station, and buses and cars going in all directions outside. I’m sure it makes sense to the locals and others who understand the language, but we quickly decided to walk. It was a long walk – about 45 minutes – and right on the limits of what we would normally do with our packs on. It was also hot, but we knew this time we were heading to a little piece of luxury that included air conditioning – the Hilton Doubletree. There was even a pool. Guess where we spent the rest of the day! 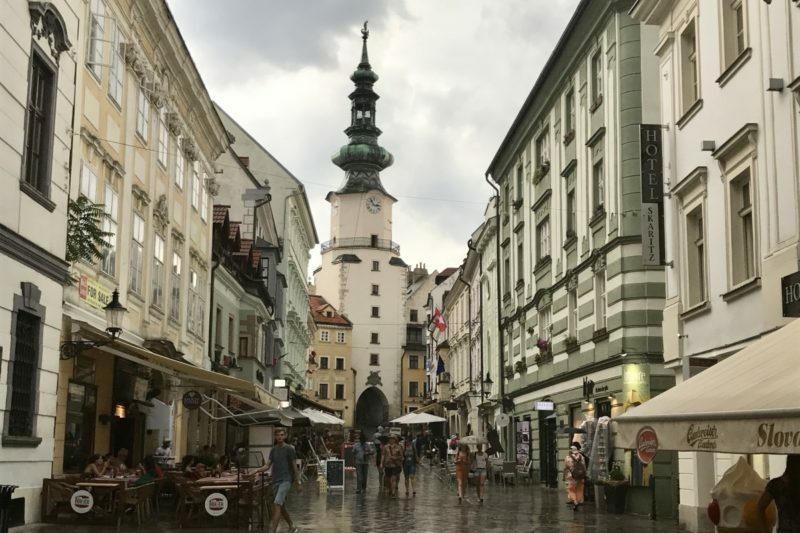 We had two full days to explore Bratislava, and first up was the challenge of getting to the Old Town. 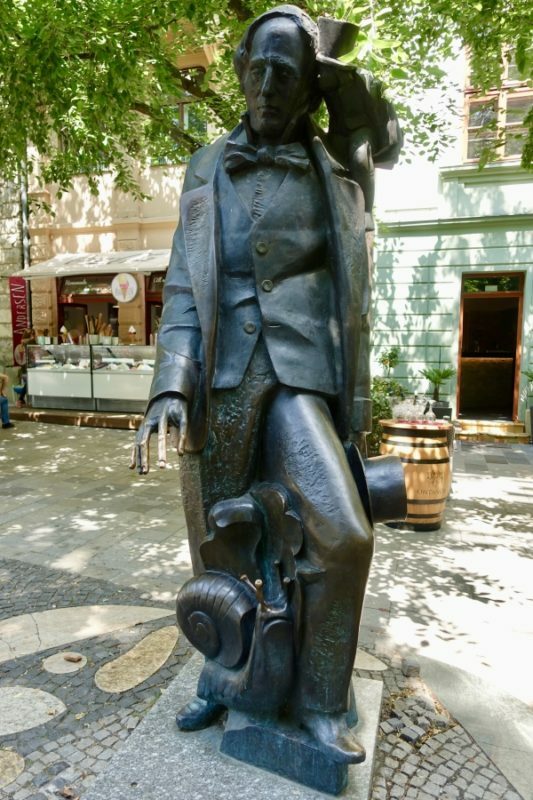 Simon had been reading that the ticket inspectors in Bratislava are particularly strict and difficult to deal with, so we wanted to make sure we knew what we were doing. We asked at reception on our way out to make sure we got the right bus and ticket. The buses here are amazingly cheap. €0.70 for a 15minute ticket, which is what we were advised to get. 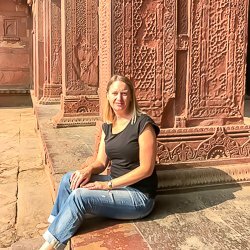 We had to go six stops on the bus, and even though that should be easily done in 15 minutes, we were cautious and got 30minute tickets for €0.90 rather than risk being caught in traffic, then caught by an inspector. It must be a common occurrence, because the girl at reception warned us too. The fine is €50 for getting it wrong. 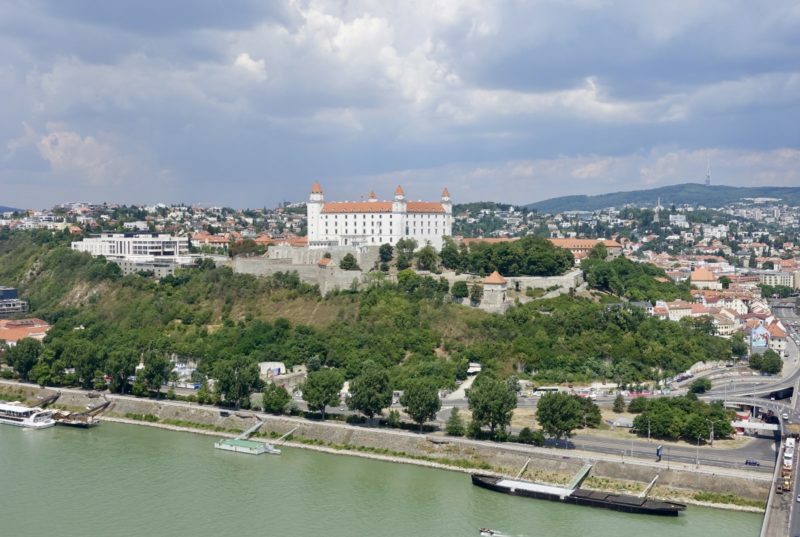 Bratislava has a small, well kept Old Town right on the banks of the Danube. Buildings were being renovated nearly every way we turned. 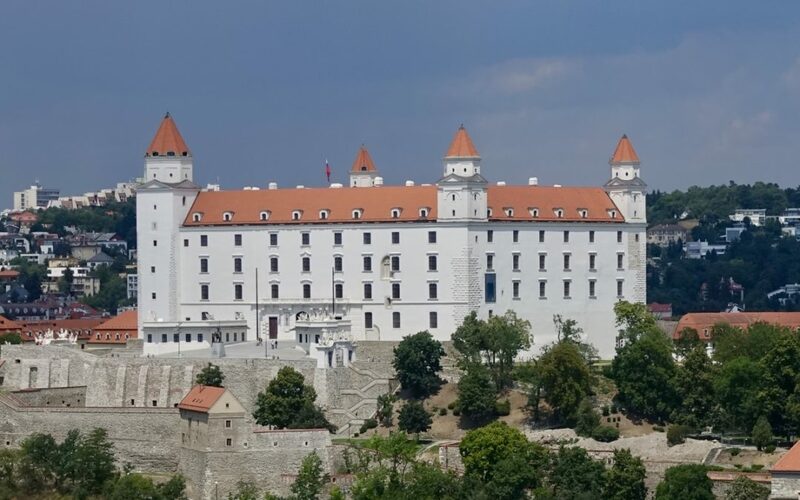 Above the Old Town on a hill is Bratislava Castle. We chose to visit the Old Town first, and began making our way through he narrow cobbled streets. We were here before the heat of the day and many of the other visitors too. 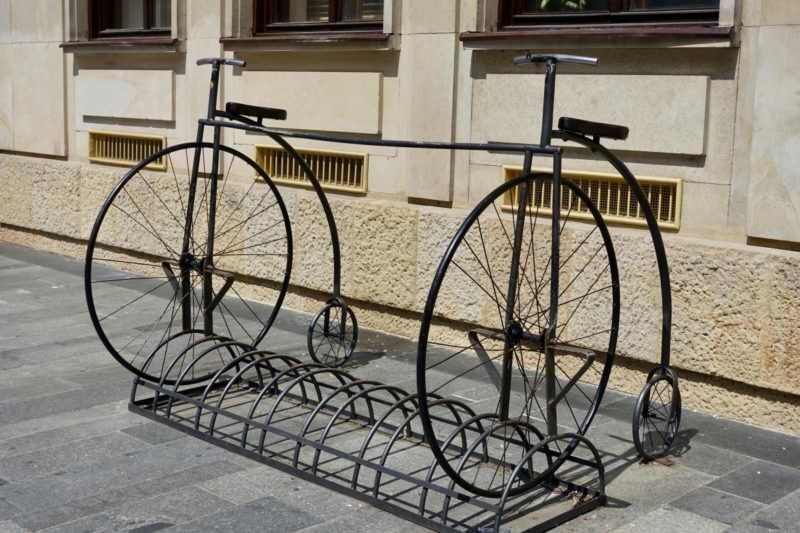 I wonder how long these bikes have been in the bike rack? We made our way first to Michael’s Gate, which is the only city gate that remains. It is topped by Archangel Michael which gives it it’s name. While the gate was nice to see, it was nothing special. 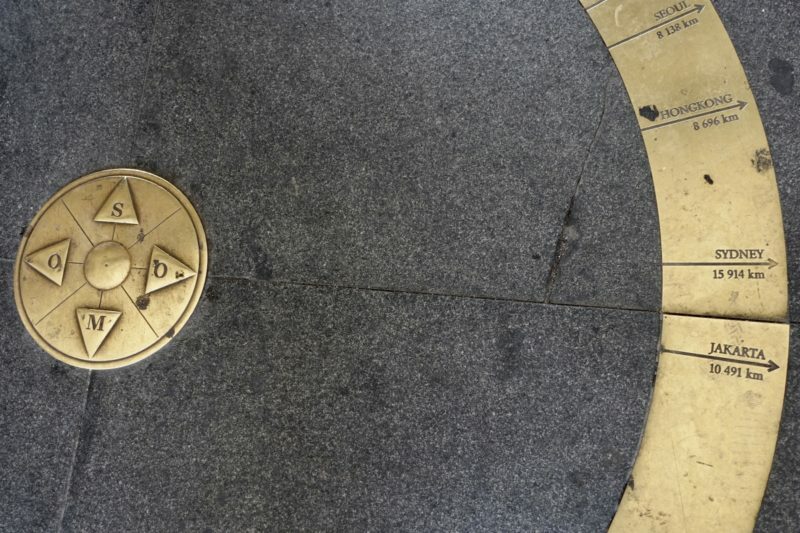 What did grab our attention though was the directional motif on the ground that pointed to many prominent cities around the world. Of all the cities shown, Sydney was by far the most distant. We really couldn’t get much further away from home! We continued to explore the streets, coming to Hlavné Námestie, one of the town squares. 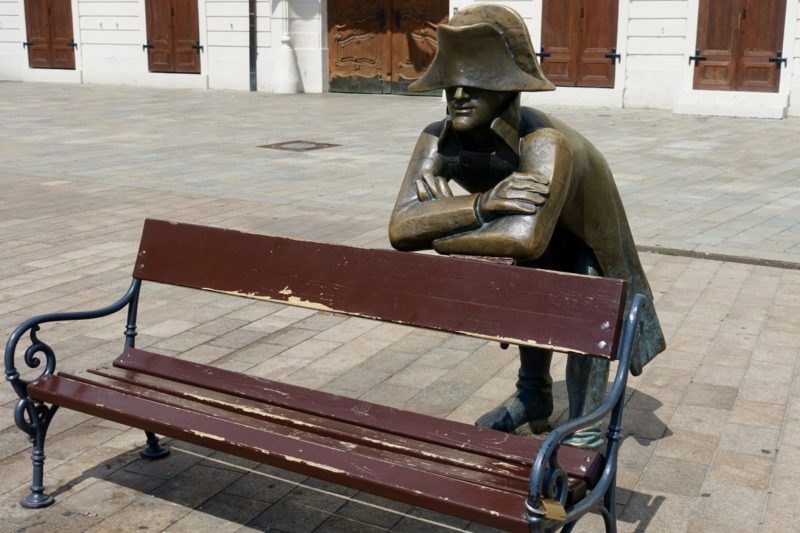 Here the popular “Napoleon’s Army Soldier” statue leans on the back of a chair waiting for some company. He’s normally not alone for long though, as the next person waiting soon replaces the last to get that requisite photo. 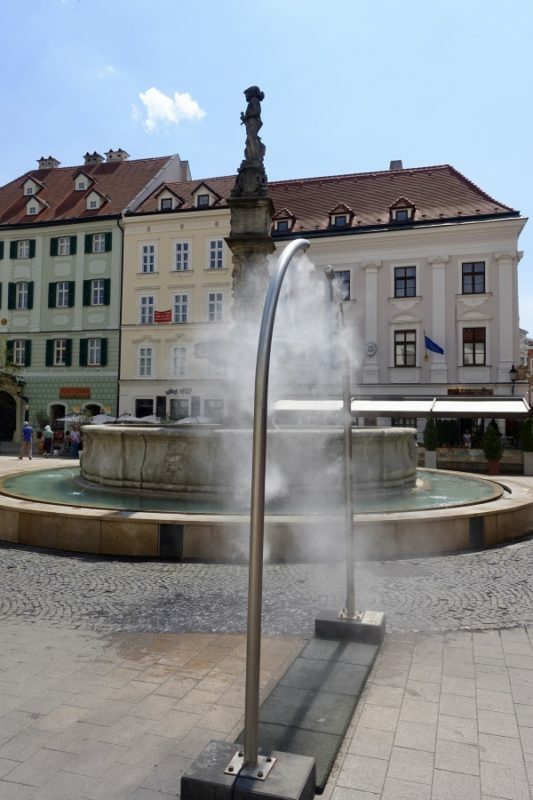 The day was really heating up, and we saw a great summer feature in the square. A water frame was set up near the fountain, and sprayed a fine mist that was lovely and cool as you passed through the frame. We could do with a few of hem back home during summer. Cooling spray to walk through a hot day. We gradually made our way down towards the river. As we did so the storm clouds began to roll in. There was no rain yet, but we could hear the far off rumblings of thunder. As soon as the Danube came into sight, something caught my eye. 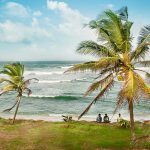 Not the legendary blue waters, but rather what was hovering over them – the UFO Tower I hadn’t researched this very well, but I had seen it mentioned. For some reason I thought this was initially a tower that had seriously been used for spotting UFO’s. Well, turns out I was wrong (who would have guessed!!!!) and it it simply an observation tower in the shape of a UFO, providing stunning views from the top. If just looking at the view isn’t enough, it also contains a restaurant and bar. 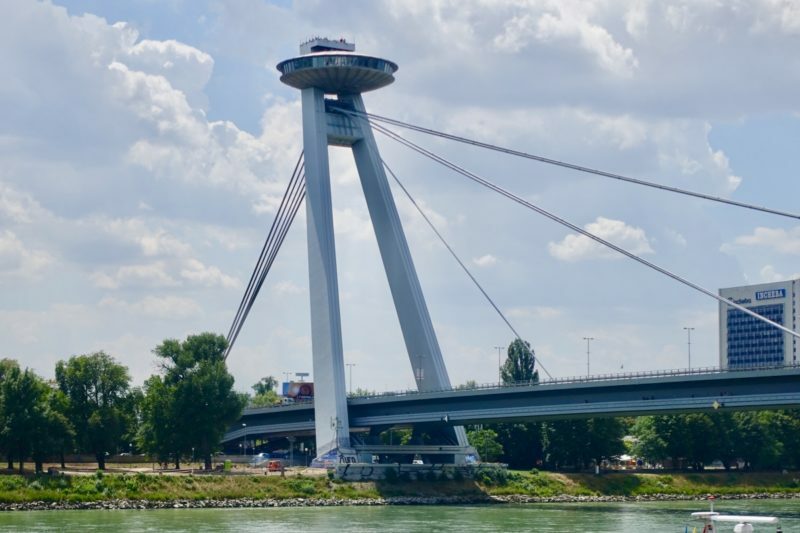 Refreshed after cooler breezes at the top of the UFO Tower and a drink in the restaurant, we walked along the banks of the Danube. Kind of sounds romantic, doesn’t it? Really it’s not. It’s quite industrial looking, with river boats berthed and tour buses parked. Our aim though was to see a newer part of the city. Once it comes into view the walk changes from industrial to modern. The Eurovea shopping mall is a huge new complex. 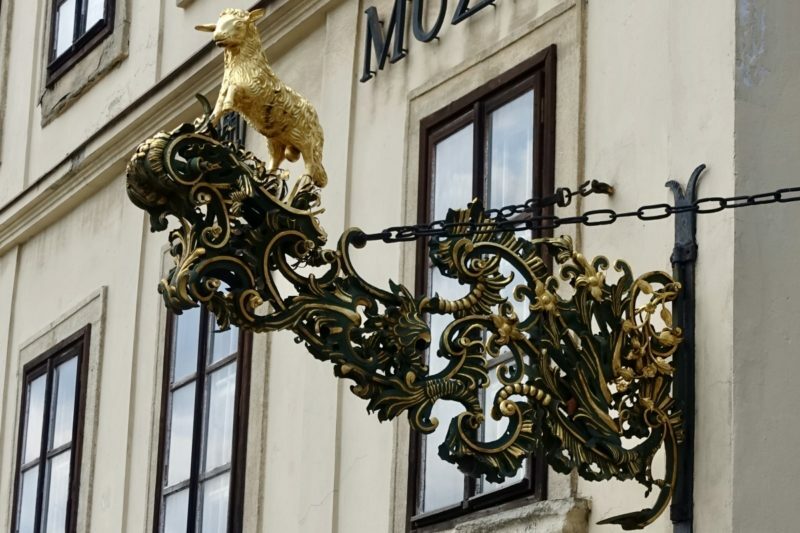 It has lots of trendy outdoor eateries along the banks of the Danube and is filled with all the big name stores that would be expected elsewhere in Europe. We grabbed a late lunch in the food court, before looking around further. Next door to the mall is a casino and cinema, and one of the buildings of the Slovak National Theatre. 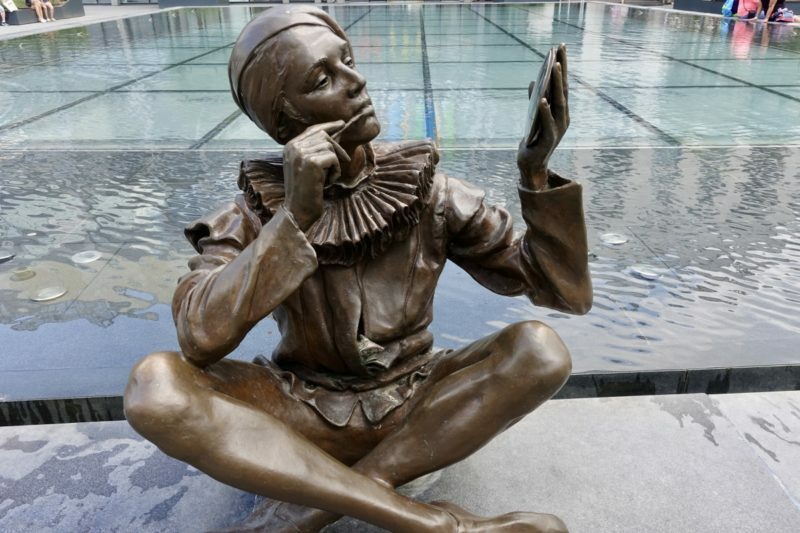 Eurovea statues have a circus theme. This one was my favourite. Our walk back to the Old Town began just as the clouds really started to gather. 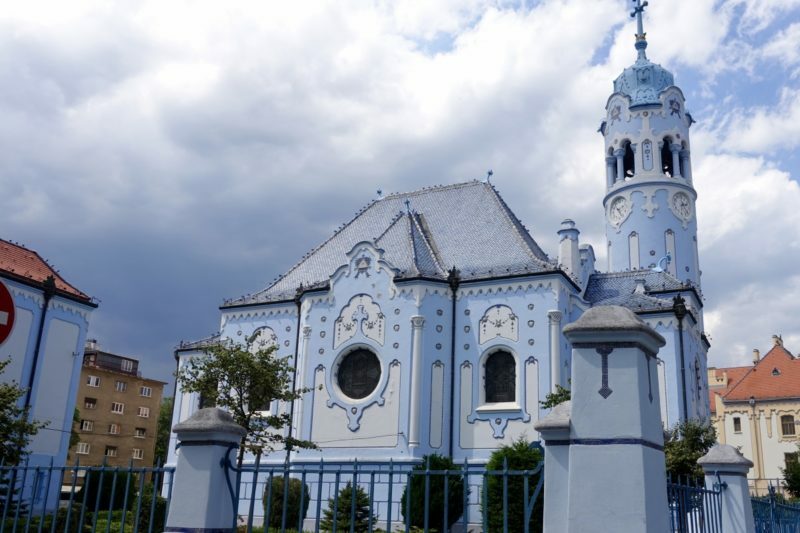 We took a small detour past the lovely Blue Church. 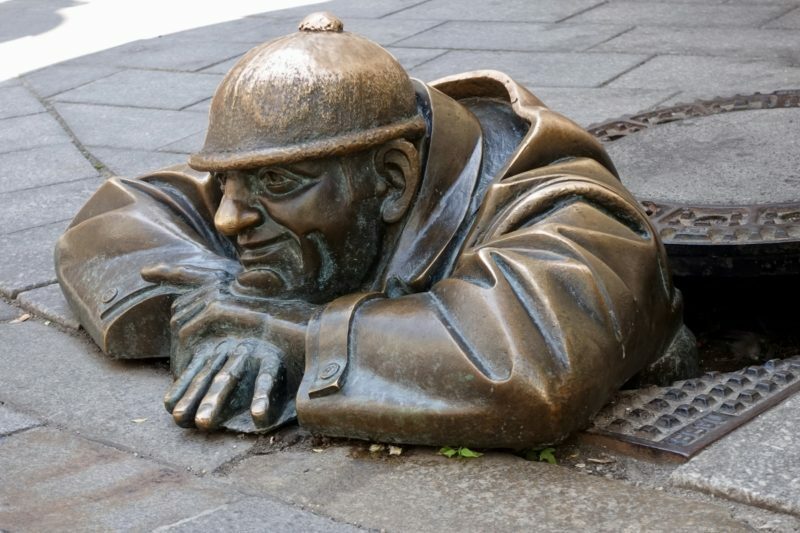 This was my favourite thing in Bratislava, it was just so CUTE! It looked like a baby blue gingerbread house with with icing for decoration. We couldn’t go inside as there was a wedding beginning just as we arrived. While I admired the building and oohed and ahhed over it, Simon was impatiently trying to hurry me along, reminding me of the ominous looking clouds. We didn’t make it! The heavens opened with big, fat raindrops, and soon we were dodging from doorway to doorway, along with hundreds of other people, trying to not get completely soaked. We failed, and soon gave up, deciding to enjoy the rain as it cooled us off. Thanks to the rain we went straight to the bus stop, and back to the hotel to dry off. Day two started with the climb up to the castle. 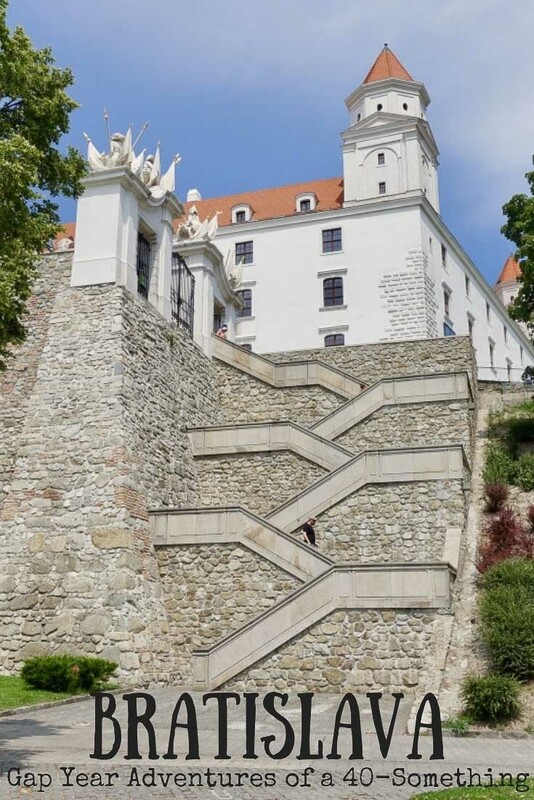 Actually, it started with finding the right path to get up to the castle. We had been told it was easy, just follow the signs. But we had come from the bus stop, which is a slightly different angle than the Old Town itself, and we took a couple of wrong turns before we finally found which way to go. We weren’t the only ones confused though, as we met up with another visitor who also wasn’t sure of the way. Maybe the signage wasn’t as clear as we had been told it was! The view from the top was fantastic. We explored the outside of the castle, but decided not to go inside. Around the back of the castle were the lovely gardens we had read about that were worth a visit. Unfortunately the gardens were a little less lovely than what we were expecting. Mostly because they have only recently been reconstructed, and really need a few more years before the plants really grow into the established garden in our minds. 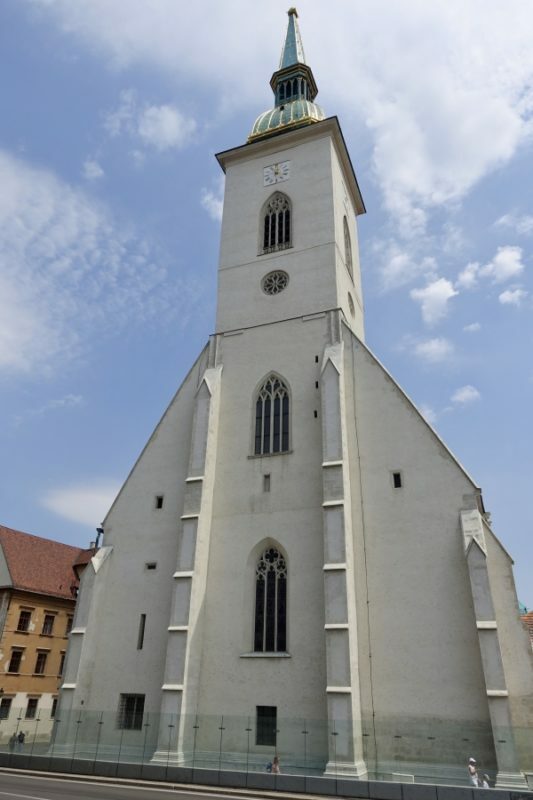 Our next stop is the big church that can be seen all over Bratislava, St Martin’s cathedral. Unfortunately our visit was on a Sunday, so the church was closed for services until mid afternoon. 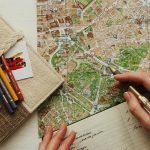 Instead we began the search for somewhere for lunch. We couldn’t decide between traditional food or something cool in the heat. In the end traditional won, and we ordered Goulash. Yum. 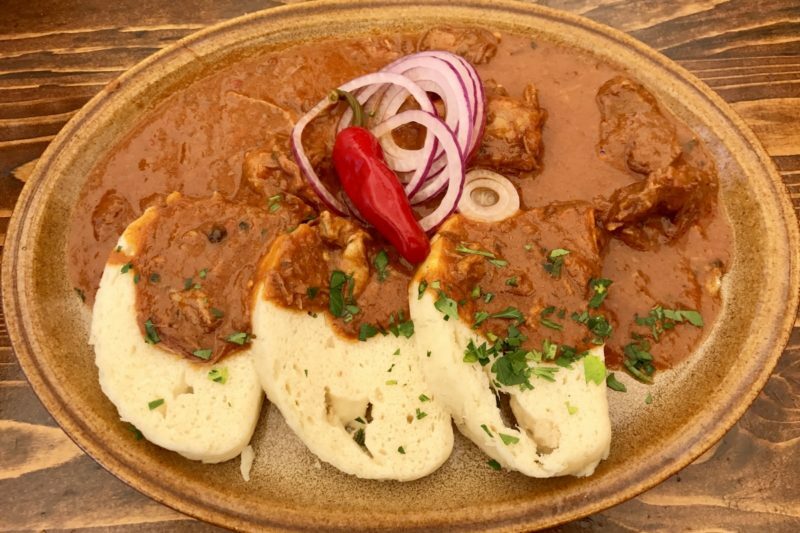 The goulash we ordered in Bratislava. It was delicious. A little more wandering the streets (we sound like vagrants!) and we retired back to the hotel swimming pool to enjoy another cooling dip before we moved on the next morning. I just love all the street signs. No idea what this one was for, but it took my fancy. 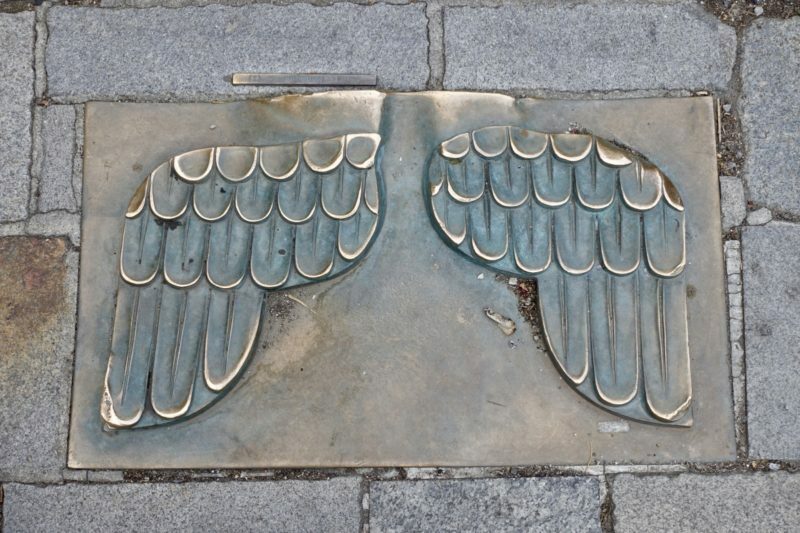 Can you finds these wings on the streets of Bratislava when you visit? 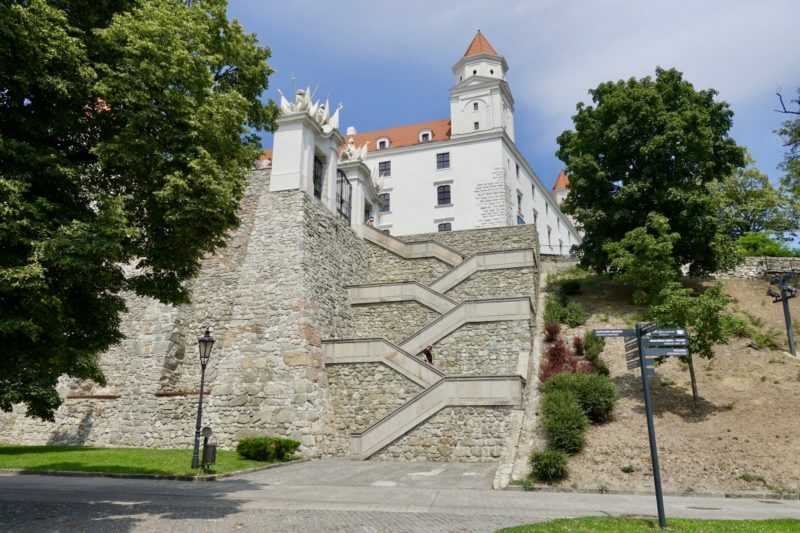 Bratislava is clearly a less prosperous city than it’s neighbour Vienna, but it is still worth a couple of days in your European itinerary. It has some really quirky features that made me smile. Public transport was plentiful and easy to use, but it’s important to get the tickets right or you risk a decent fine. We were told the inspectors are particularly keen on checking tourists. We only saw one inspector, and it was on our way to the train station as we left. He was in plain clothes and we had no idea until he asked for our tickets, so don’t assume you will be able to pick them out in advance. 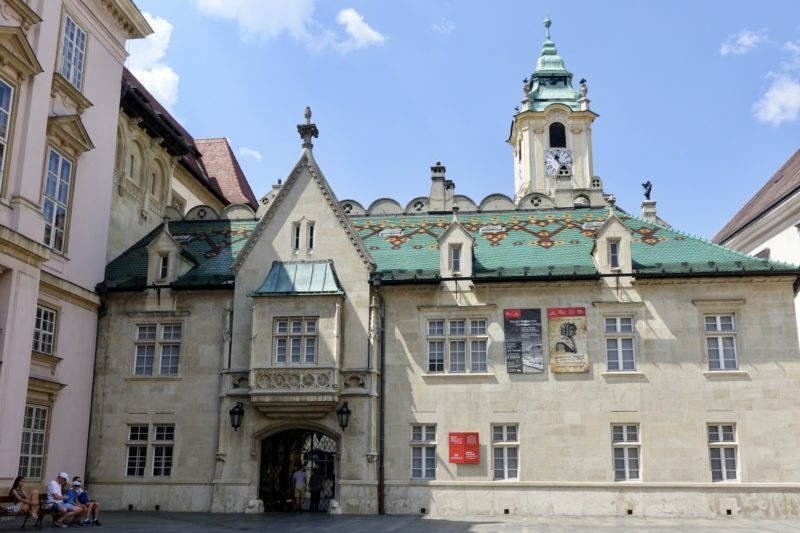 Bratislava is CHEAP. We saw a distinct decrease in prices here across the board. Slovakia use the Euro so there was no change in what we had been using until now. We didn’t have a huge requirement for wifi when we were out and about because the centre of Bratislava is (almost) impossible to get lost in. Free wifi was available everywhere we sat down to eat if we needed to quickly check something. 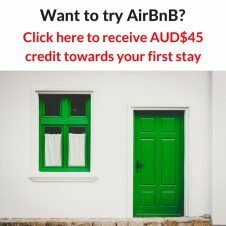 €76 per night including breakfast. 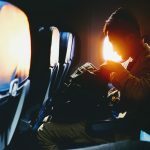 Great Post with Beautiful photos. Love the Blue Church and the Circus Clown Statue. 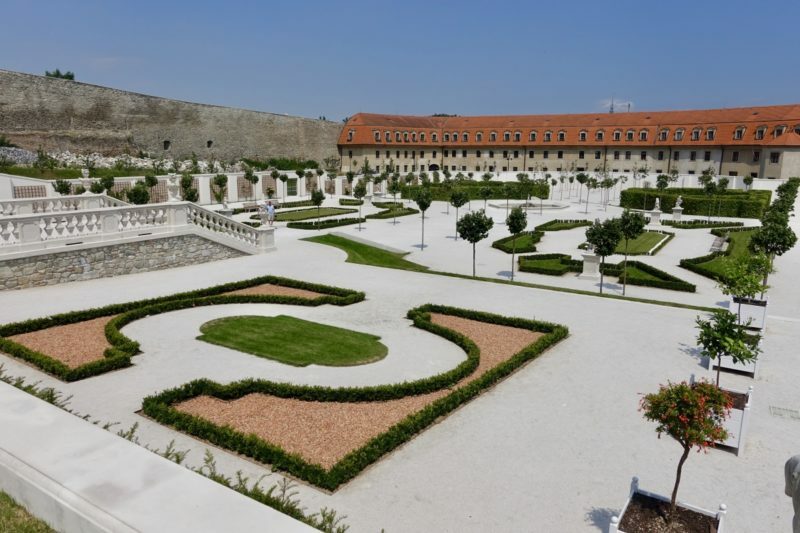 Bratislava Castle and Gardens look amazing. The cool mist spray is a great idea. (Walkers Arms has a Mist System outside in the Beer Garden.) Love following your adventure Josie. Thanks Carol. I love hearing all your comments too!